The jump from 250,000 to 500,000 euros properties is large. At 500K you are looking at some of the finest properties available in Spain and not just a pre war semi in a London suburb. Prepare to be impressed. 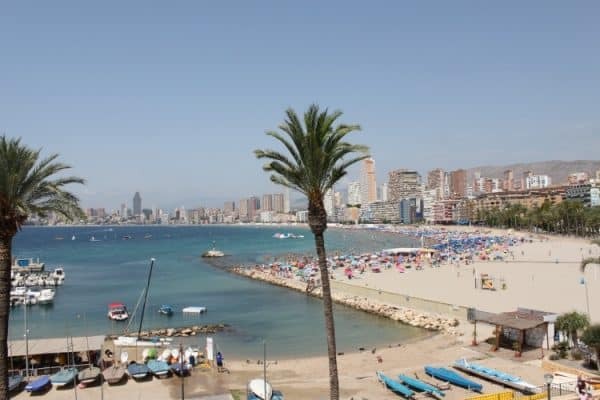 We are delighted to offer a unique 4 bedroom apartment for sale on the 1st line of Poniente beach, in a privileged area with lovely views of the port and the sea. This stunning duplex apartment has 125 m2 distributed on 2 floors. On the main floor are the 4 double bedrooms with fitted wardrobes and 1 full bathroom with shower. 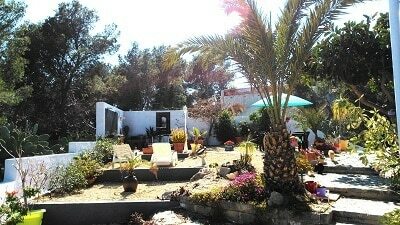 On the top floor is the living room leading to a large glazed terrace where you can enjoy the most amazing Poniente beach views, a large kitchen fully equipped, utility area and 1 bathroom with shower. From the living room you have direct access to the terrace with magnificent views over the Mediterranean. The apartment is fully-renovated and is offered in absolutely perfect condition. It also has air conditioning (hot/cold) and prestige interior decoration throughout the property. The location is fabulous – just by the marina, Club Náutico and famous Parque Elche/Dove park. Benidorm’s 3 main beaches are just steps away. You are located in the typically Spanish Old Town with a fantastic choice of eateries from every continent, every style and at every price range. Whether it is fun,fun,fun Tapas Alley with its great range of entertainment or gourmet dining for a special occasion, you will not be disappointed. You are a few moments’ walk to both the Poninete and Levante areas where you can enjoy the huge choice of facilities the resort offers. Banks, supermarkets, shops, taxi ranks, bus stops are all within a few minutes. A very special property. We recommend immediate viewings if you are keen to acquire a prestige property in a unique location. We guarantee that you will not be disappointed. 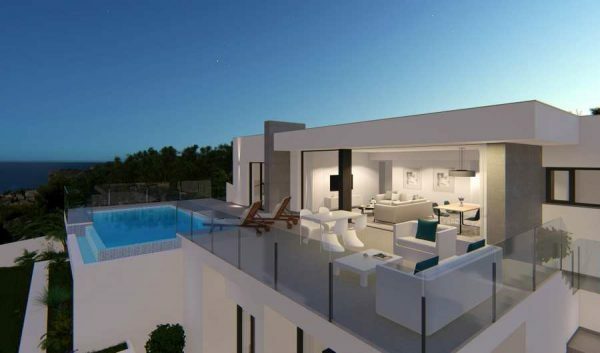 Brand new villa development at the highest point in Ciudad Quesada, Alicante with stunning views towards the coast and surrounded by mountains. Ciudad Quesada (Rojales) is a well established area and is a traditional Mediterranean town in the bay of an international community that continues to grow. It enjoys a mix of the traditional and modern with two typical Spanish markets held on the outskirts of the town but also modern shopping and leisure facilities with lots of shops, bars and restaurants. The schools, medical facilities and town hall are all geared up for expat residents. Rojales is a short drive from the Blue Flag beaches of Guardamar and also hosts its own water park and golf course. Alicante Airport is less than 45 minutes from the property whilst Murcia Airport and Alicante City are approximately one hour by car. Selection of 6 brand new contemporary style villas located on flat plots in established urbanization near to beach and protected forest. The property has three double bedrooms and three bathrooms, off street parking, private swimming pool. Further details upon request. Full plans available. Brand new villa for sale in Javea Rafalet with three bedrooms private swimming pool with stunning panoramic views to the Montgo We are pleased to offer this brand new villa for sale in the sought after area of Rafalet in Javea close to the golf club and several good restaurants with superb open views to the West It comprises of open plan living dining room with American style kitchen fully equipped with floor to ceiling windows allowing the amazing views of Montgo and surrounding valley two double bedrooms with fitted wardrobes and a family bathroom on the ground floor. Upstairs you will find a master bedroom complete with dressing room and en suite bathroom From this room through large picture windows you have even better views On the lower level you will find an integral garage with automatic door a guest bathroom and a large storage room which could be developed into further accommodation The corner plot is sloping over two levels with ample parking and landscaped gardens with many fruit trees complimenting the modern style of the house There is under floor heating throughout as well as hot and cold air conditioning. 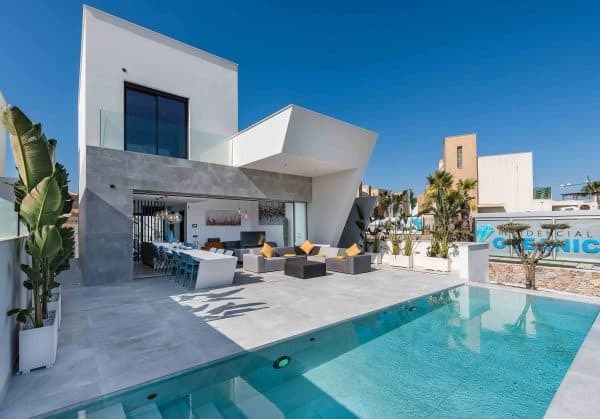 A modern Villa located in Lirios Design, Cumbre del Sol Residential Resort,in Benitachell – a consolidated residential area with magnificent sea views. 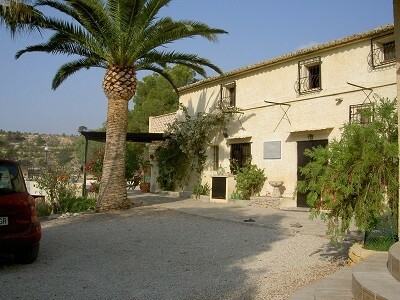 This property is ideal for all year-round enjoyment. Villa Creta has a design open to the sea and the Mediterranean light, on a single floor, which makes it extra comfortable. With 3 double bedrooms and spacious wardrobes, the master bedroom also has an en-suite bathroom and direct access to the terrace.The house is completed with a second bathroom, the living-dining room, porch, hall, a fully equipped kitchen with an attached laundry room and a car park. 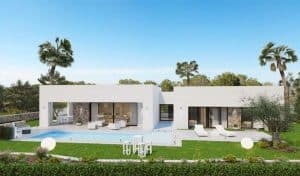 The exterior has been designed to enjoy the Mediterranean weather with a large terrace accessed from the master bedroom and the living-dining room, a swimming pool and the villa’s garden, which has outstanding sea views. The main living area on the ground level is set out to 3 bedrooms and 2 bathroom, the separate kitchen is full equipped. The main salon/living room is extremely large and is bright and airy and has patio doors leading out to the terraces that surround the property, plenty of space for outdoor living. The bedrooms are double sized and have fitted wardrobes. The main floors are tiled throughout and decoration is neutral and bright. This property has been built with leisure and relaxation in mind. There is a heated swimming pool on the lower level and an extremely large under build that is equipped with a sauna, separate bathroom with spa zone and infra red sauna, as well as a large room that can be turned into a gymnasium or office or separate living accommodation. Loads of possibilities with this chalet! The outside area is set out to paved patios and terraces. There is a barbecue and an outdoor wood oven ideal for parties and entertaining. A large 15th century mil situated on the outskirts of Vilajoyosa, just ten minutes from all the services that this ever popular coastal town has to offer including a fabulous beach, bars and restaurants to suit every taste abound here as well as everything else anyone could need. The main property has 4 bedrooms, bathroom, separate kitchen, large living-dining room on a split level, entrance porch, large barbecue area and in addition there are two separate guest apartments. The first guest apartment has 1 bedroom, 1 bathroom, open plan kitchen and a small living area, the second has 2 bedrooms, bathroom, kitchen and living-dining area, there are also two swimming pools. 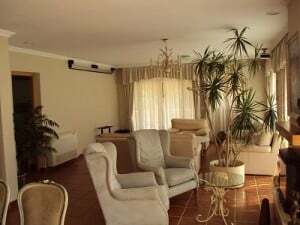 A beautiful detached Villa set in the grounds of the Bahia Golf resort. With 5 bedrooms and 5 bathrooms there is plenty of room for guests. Several private patios and grounds with private pool. This property is likely to attract a buyer who want a superb location, close to the Mediterranean, the “Bright Lights” of Benidorm and “may” want the odd round of golf ….or two! It is also a low maintenance property and very much a lock-up-and-go villa which is ideal if it is being acquired as a second home. This wonderful modern villa is set in its own grounds of 518m2, nestled in the pine trees but close to all amenities. The house has a total floor size of 167m2 set out over 2 floors. The main living area has 2 bedrooms, one ens-suite. There is an additional family bathroom. Both bathrooms upstairs have baths. The kitchen is separate and fully fitted to a modern standard. The main living room is very spacious with wonderful panoramic views of the sea and mountains. The bottom section of the property is laid out to separate living accommodation again, 2 double bedrooms and 1 shower room, separate living room and American style kitchen. The property has been decorated in neutral colours throughout making it light and airy. Please also view our gallery. (Editor’s note. I visited this house recently. It is quite stunning and was definitely a 800,000+ property before the “property bust”. Well worth visiting. 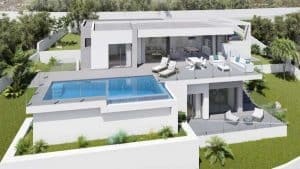 With the pound continuing at over 1.30 to the euro, Belgian buyers coming back and renewed interest from Scandinavia and the Netherlands these properties at around the 500,000 euros are bound to interest discerning buyers. These buyers are unlikely to be trading up in Spain but more likely will be investors. They will know exactly what they want and will accept no second-best or compromise especially when it comes to location. Here we have a selection of properties from a spacious 2 bedroomed apartment with one of the most prestigious addresses in Europe, through a golf villa, to a 15th century mill. All very different but ALL offering value for money. All these properties I offer today show no compromise on quality, value or location. 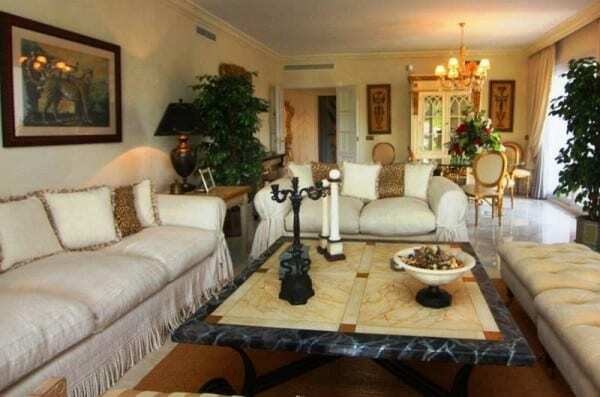 Lovely ground floor apartment within this 5 star complex, on the Golden Mile, Marbella. The urbanization is gated with 24-hours security; community pools (including one outdoor heated pool and another indoor heated pool); gym and beautifully maintained communal gardens. The property comprises: entrance hall; large living/dining room with 2 terraces, one which is smaller and enjoys garden views, and the other one which is larger with views and access to the gardens; kitchen with separate utility area; en-suite master bedroom; guest bedroom opening onto main terrace and with separate bathroom. Two private parking spaces and storeroom included in the underground garage. In an ideal location: close to all amenities and within a 10 minute walk to the beach.